Ideally located in the heart of the Hungarian capital, Le Meridien is a real jewel in the most fashionable district of this vibrant city. 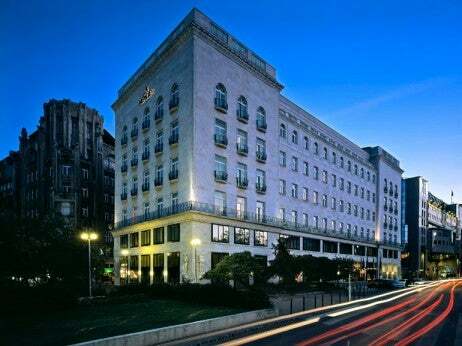 Housed in the former Adria Palace, a magnificently restored and protected monument built in 1918, it is situated just minutes away from the city’s lively business district. The hotel features 26 suites combining elegance, comfort and state-of-the-art amenities. While the Adria Palace Bar can offer you evenings of live jazz and elegant cocktails, the hotel’s restaurant, Le Bourbon, will guarantee you first-rate French cuisine from Executive Chef Laurent Vandenameele who received the Toques Blanches du Monde award for his gastronomy in 2009. Why we love it: This beautifully designed suite has accommodated several world famous singers, actors and politicians, including the former American president George Bush and Plácido Domingo. It features a private terrace, offering stunning views of Budapest, a dining area that can seat up to eight people, a log fireplace and a separate guest restroom.